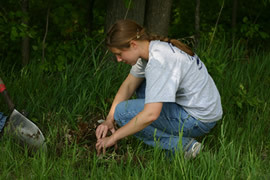 Active land management has occurred since Merry Lea came under the ownership of Goshen College in 1980. Land management activities support all aspects of Merry Lea’s mission. Merry Lea maintains, restores and manages for a diversity of native Northeast Indiana plant and animals. This diversity is not only important at a landscape level. It also provides for the broadest range of investigative/learning experiences to support Merry Lea’s educational mission. These efforts are guided by the director of land management and a natural resource management plan that is currently being updated and linked into a GIS. This plan reflects the objectives for each of the 116+ management units, the current status of each unit, a record of historic land use activities, and past and planned management practices. Human needs are considered in the management of Merry Lea’s land. Humans are recognized as a natural part of many ecosystems. Given that recognition, Merry Lea’s land base is also managed to provide opportunities for appropriate educational, recreational and product/income activities consistent with the organization’s other mission components. Merry Lea’s landscape is part of the larger landscape of Northeast Indiana. Consultation with fraternal land management partners, such as the Indiana Division of Nature Preserves and Indiana Chapter of the Nature Conservancy, has led Merry Lea to manage its landscape so as to provide 30-35% in early successional (herbaceous and shrub) native plant communities. See restoration efforts. To establish and/or maintain early successional plant communities, Merry Lea property management staff employ: high-mowing, herbicide application using “best practices”, water level control, prescribed burning, and hand tools such as chainsaws, brush saws, loppers. These practices are also utilized to control invasive plant species which have become established on numerous sites due to historic land use practices. Using the above management practices Merry Lea also actively identifies and restores ecosystems representative of the pre-European settlement (ca. 1830’s) landscape found in NE Indiana. These include: wetland communities (52 ac. ), dry oak woodland and savanna (13 ac) and tall grass prairie (77 ac.). Except for the Bear Lake Prairie, prairie sites were created on abandoned cropland using local genotype (purchased or collected on-site) grass and forb (wildflower) species that have be recorded as native to Noble County (Flora of Indiana, C. Deam, 1940). Creation of prairie habitat and restoration of the oak woodland community will continue for decades to come. Merry Lea’s land base is also managed as a field laboratory to support the research efforts of Merry Lea staff members who have Goshen College faculty appointments. The site is also used to test research questions posed by Goshen College students and their professors in the Dept. of Biological Sciences. In addition, research questions are developed to gain a better understand the functioning of Merry Lea’s ecosystems as a response to specific management actions.